The focus of this third column devoted to grazing snails is on some of the less traditional algae-eating snails; specifically, the Conchs, the Ceriths, the Cowries and one species of a group called the Columbellids. Unlike the trochoideans, but like the animals that I discussed last month, these animals are not closely related and are from several distinct and different evolutionary lineages. This means that they don't look or behave alike. Their basic snail features, however, are the same as in the trochoideans, and I refer the reader to May's column for the discussion of anatomy and physiology and how they relate to the necessity of slow acclimation to differing conditions, particularly salinity. As with the other snails, these animals all do best at normal reef physical conditions where salinity remains in the 35 ppt to 37 ppt range, and the temperature is between 80°F and 84°F. The basic method of feeding also remains the same; the animals "lick" the surface of the substrate with a structure which has been called a "rasping tongue," and which biologists call a "radula." The radula in these snails differs significantly from the rasping organ found in the trochoideans. For example, it has a lot fewer teeth; however, the teeth are generally more robust and structurally specialized, and their basic function remains unchanged. There are a LOT of different snail species, and as I mentioned above, the grazers that are the subject of this column have no similarity of shape. Not only that, but with most of these useful species, similarly appearing animals often have decidedly different habits. Not only are these look-alike species not benign grazers, but instead they may prey on desirable reef aquarium species. So, it pays to closely examine the animals that you intend to purchase or receive from dealers. A few suppliers do a good job of separating these dangerous species, but I have seen a number of them surfacing at various places, and this is mostly due to faulty collection and identification. As I have mentioned in the previous columns, it is up to the individual hobbyist to be sure of the identification of these beasts. I again list the following three references, which can be very useful in determining which snails have appeared in our tanks. These bookshave the added advantage of being found in many local public and university or college libraries, and so may be readily available for consultation. Abbott, R. T. 1974. American Seashells. Van Nostrand Reinhold Company. New York. 663 pp. This reference will allow you to make tentative identifications of about 30% to 50% of the Caribbean reef snails. Abbott, R. T. and S. P. Dance. 1982. Compendium of Sea Shells, A Color Guide to More than 4,200 of the World's Marine Shells. E. P. Dutton, Inc. New York. 410 pp. This reference is good for identifying snails from marine environments around the world, but is missing a lot of, mostly smaller, species. Keen, A. M. 1971. Sea shells of tropical west America. Stanford University Press. Palo Alto, Ca. 1064 pp. This reference is excellent for Eastern Pacific and Gulf of California animals, and is good for some other tropical Pacific animals. Individuals of a few species from the immense group that taxonomists refer to as the Superfamily Cerithiacea are becoming relatively commonly found in the reef aquarium hobby. The Cerithiacea consists of several large subgroups, called "Families." The most common of these are the Family Planaxidae, which contains the genera Planaxis, Hinea, and Quoya; the Family Modulidae, consisting of the genus Modulus (1,2) whose species look quite trochoidean; the Family Batillariidae, containing the genus Batillaria; the Family Potamididae containing the genera Rhinocoryne, Pyrazus, Terebralia, Telescopium and Cerithidea; and the Family Cerithiidae, containing the genera Cerithium (1,2,3,4,5), Bittium, Rhinoclavis (1,2,3) Pseudovertagus(1,2), Clypeomorus, Gourmya, Colina, Trochocerithium, and Campanile. The animals constituting the species in all of these genera are relatively similar in basic appearance and are characterized by having a shell with a small, almost circular, aperture which has a small siphonal canal or "spout" which projects at an oblique angle to the long axis of the animal. Additionally, the shell is typically quite long relative to its width, and mature animals often have six or more visible whorls. They typically have a proteinaceous or horny covering, or operculum, that plugs the shell's aperture when the animal is withdrawn. In a few species the shell may be smoothly rounded, but typically the shell has some ridging that is parallel to its long axis or spiraling around it, or both. The ceriths typically found in the aquarium hobby generally come from the genus Cerithium, Clypeomorus, or Batillaria, but really almost any tropical cerithiacean would do well in aquaria provided there is an appropriate substrate, and given the non-specific nature of the collectors in the field it is likely that many others will eventually show up in reef tanks. Most of these species are found in or on unconsolidated sediments, although many others, such as those in the genus Planaxis, are found on rock. In most cases, they have been shown to be sand-swallowing organisms. Such animals eat the sediment and digest its organic material, mostly encrusting bacteria and microalgae. Those found on hard substrata are generally grazers that feed similarly to the trochoideans. Individuals from several species are commonly found in aquaria as part of the sand bed fauna. They will also venture onto rocks and aquarium walls from time to time, and use these sites to lay their rather distinctive egg masses. For more images of ceriths, see here, here, and here. Conchs, or members of the species in the gastropod group called the Family Strombidae, are strictly herbivorous. Within this family are several genera, including Strombus (1,2,3,4,5) (true conchs), Lambis (1,2,3) (spider conchs), Tibia (1,2) (tibias), Varicospina (beak shells) and Terebellum (terebellum), that differ significantly in shell form and structure. Their internal anatomies, however, are similar. Unfortunately, many of these animals, particularly those in the genus Strombus, have a basic shell shape that most people think is more representative of the carnivorous whelks. This type of shell is tapered at both ends with the front end elongated out into a calcareous spout or siphon. In some cases, ignorant or malicious dealers have sold some of the predatory whelks as various conchs. There is, however, a surefire way of discerning whether you have a real conch. When the animal extends from its shell, look closely at its eyes. In all of the animals in this group, the eyes are large and evident, located at the end of a long stalk, and they possess an evident eyeball with a visible pupil. They are visually oriented animals and will watch you. In the predatory whelks the eyes are typically just a small black dot with no discernable structure and are located at the base of the tentacles coming off the top of the head. 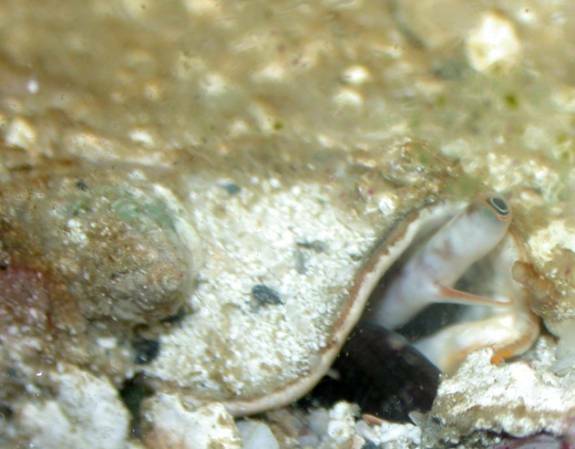 The conchs have a long and evident proboscis which they use to bite off chunks of algae. In a very real sense, they are not rasping grazers but biting eaters; however, they are superb at eating algae. Figure 1. A partially buried Florida fighting conch, Strombus alatus, showing one eye extending from the shell aperture. All strombids are animals of the sand and have a small muscular foot which is not adapted to crawling on rocks. They actually move by lurching or jumping, in what has been called "saltutory locomotion" by the researchers who have studied it. Saltutory is a $5.00 word for "jumping." Never let it be said that invertebrate zoologists would use a simple word when an odd or complex one was available. This mode of locomotion is good for sand substrata, but is inefficient and largely ineffective when moving on rocks, so the snails tend to stay on the sand once they have reached a shell length of an inch or so. A good-sized sand bed is needed to keep these animals successfully. Generally, as a rule of thumb, there should be about one to two square feet of open, algae covered sand per inch of snail shell length. Conchs will move around the bases of the rocks and remove algae from quite high up on the rocks with their amazing proboscides. They are interesting animals, and a valuable addition to a tank that can support them. Figure 2. 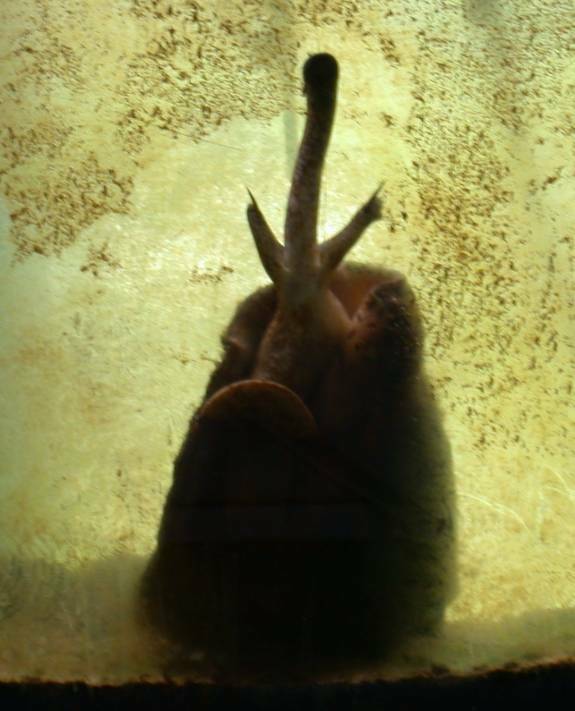 An eight-inch long Strombus gigas feeding in one of my experimental tanks. I didn't bother to clean the diatoms off the walls of this tank, and this animal fed well upon those algae. Note how the proboscis can reach some distance away from the animal. Some of them, such as the Queen Conch, Strombus gigas, grow to quite large sizes. Adult queen conchs may reach 16 inches in length and are really too large for any home aquarium. The ones for sale in the aquarium hobby are aquacultured and are small juvenile individuals, often about one or two inches long. However, if given enough algae, they do grow well; I have had one that added an inch of shell length per month for about a year. In doing so, they will get too large for a small tank and will then starve to death. Other smaller conchs are equally good at grazing on algae, and should be purchased instead of Strombus gigas. Several of the smaller conchs, such as the Florida fighting conch, Strombus alatus, have the habit of disappearing under the sand for extended periods. In some cases, they actually will move along under the surface of the sediments, eating algae; in other cases, they will stay in one place but use their proboscis to forage in the sediments up to a couple of inches from the animal. Although they appear to be invisible, they often extend their eyes to or slightly above the sediment's surface, and careful observers can find them by searching the sediment for the watchful snail. For more images of strombids, see here. Cowries are in the genus Cypraea (1,2,3). This is another of the many huge groups of snails. There are about 500 species described in this genus, and some of them are quite excellent herbivores. Cowries are easily distinguished from all other snails. Their shell is basically ovoid, with the aperture on the bottom. This aperture is a slender opening, and lined on both sides by calcareous bumps or nodules. The shells are highly polished and often brightly colored, but the mantle that comes out and covers the shell when the animal is moving is often even more brightly colored. Simply put, they are beautiful animals worthy of investigation to find some that are appropriate as grazers for our aquaria. Although seldom seen in the U. S., the money cowrie, Cypraea moneta, is both abundant in nature and an excellent herbivore. 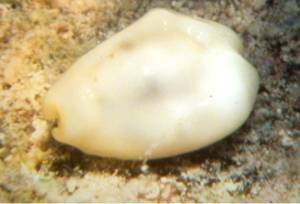 A similar species, the ring cowrie, Cypraea annulus, is likewise exceptionally common in many shallow reef environments, and is also herbivorous. These two species are small, about an inch in length, and do very well in marine aquaria. Tiger Cowries, Cypraea tigris, are also good herbivores, but they reach lengths of about four inches and are quite capable of rearranging unstable aquarium rock work. 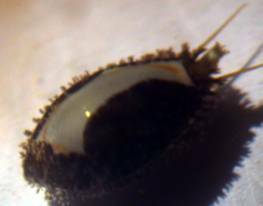 Many of the other cowrie species also may be good herbivores, but unfortunately we have little real data about their diets, and only a few non-herbivorous or very large species are commonly available. Many of the few cowries whose diets have been examined feed on sponges, tunicates, or soft corals, but the diets of most species are not known. These are beautiful animals, and as our information base grows, many of them should be acceptable as herbivores for our systems. For more images of cowries, see here. Figure 3. Two cowries that are good herbivores for the marine reef aquarium. Both species reach lengths of about one inch. Left: Ring cowrie, Cypraea annulus. Right: Cypraea moneta. Dove shells, or snails in the family Columbellidae, are common in all marine environments, and they form another exceptionally diverse group. Some of the genera in the family are Amphissa, Alia, Euplica, Strombina, Anachis, Columbella, Parametaria, Pyrene, and Mitrella, among many others. They tend to be small animals and are nearly ubiquitous in shallow water marine ecosystems, including reefs. These are animals that are generally considered to be either predators or scavengers, but as a whole the group is poorly studied, and the natural history of most species is simply unknown. Interestingly enough, at least one species has been marketed quite successfully as a herbivore, and indeed this species is a good algae-eating snail. 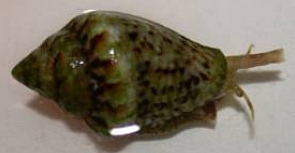 This species, although sold as the Pacific spotted conch, Strombus maculatus, is not that species, and actually is a columbellid snail, probably in the genus Euplica or Pyrene. The taxonomic status of that particular genus is uncertain, but in any case, it is a columbellid, similar to what is illustrated as Pyrene versicolor (Note: the linked image is reversed, the aperture should be on the right) by Abbot and Dance, 1982; p161. This particular species reproduces well in aquaria by laying capsules on the walls of the aquarium. Successful reproduction in aquaria is frequent, and these nice little snails are becoming quite commonly found in marine aquaria throughout the United States. For more images of columbellids, see here and here. Figure 4. The columbellid offered for sale as Strombus maculatus. This animal seldom exceeds one half inch in length. Note the eyes at the base of the tentacles in the right image. Compare with these images of actual Strombus maculatus. The number of snail species sold in the reef aquarium hobby as algal grazers has increased dramatically over the last decade. Some of these animals, such as the Norrisia and Tegula species discussed in the May column, are unsuitable for reef aquaria and their continued marketing is really a symbol of the irresponsibility of some dealers and distributors. Additionally, many of the truly subtropical or temperate animals sold in the hobby are also inappropriate for reef aquaria. Unfortunately, these latter species are still commonly available and probably constitute the majority of snails sold as grazers. On the other hand, the marketing of such true coral-reef animals as Hawaiian Trochus, the money and ring cowries, several species of conchs, and the small columbellid species known as "Strombus maculatus" is quite indicative of either fortunate happenstance or the application of reasonable natural history information to develop alternatives to some of the unsuitable animals often sold as "reef grazers." These true reef animals add a natural component to our aquaria. They also live long and prosper in our systems, while providing a stable means of controlling various types of algae. Fretter, V. and A. Graham. 1994. British Prosobranch Molluscs. 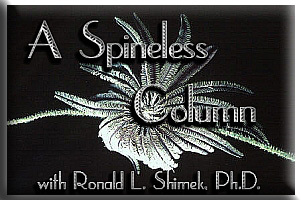 Their functional anatomy and ecology. Ray Society. London. 820 pp. Houbrick, R. S. 1978. The Family Cerithiidae in the Indo-Pacific. Part 1. Genera Rhinoclavus, Pseudovertagus, and Clavocerithium. Monographs of Marine Mollusca.1:1-130. 98 plates. Houbrick, R. S. 1985. Genus Clypeomorus Jousseaume (Cerithiidae: Prosobranchia). Smithsonian Contributions to Zoology. 403: 131 pp. 62 fig. 33 tab. Jung, P. and R. T. Abbott. 1967. The Genus Terebellum (Gastropoda Strombidae). Indo-Pacific Mollusca. 1(7): 445-454. Kohn, A. J. 1983. Feeding biology of Gastropods. In: Wilbur, K. M. Ed. Physiology (2). Academic Press. New York. pp. 1?63. Kohn, A. J. 1987. Intertidal ecology of Enewetak Atoll. In: Devaney, D. M., E. S. Reese, B. L. Burch and P. Helfrich. Eds. The Natural History of Enewetak Atoll, Volume I, The Ecosystem, Environments, Biotas, and Processes. United States Department of Energy, Office of Scientific and Technical Information. Oak Ridge, Tennessee. pp. 139?157. Voltzow, J. 1994. 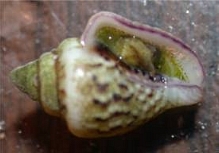 Gastropoda: Prosobranchia. In: Harrison, F. W. and A. J. Kohn. Eds. Mollusca I. Wiley-Liss. New York. pp. 111-252.